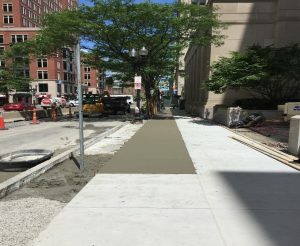 This project consisted of the renovation of the existing sidewalk pavers for Liberty Mutual Insurance along St. James Ave., Berkeley St., and Stuart St. entrances. McCourt Construction began the work with the demolition of the existing pavers and concrete slab underneath the sidewalk. After the demolition, the site was fine graded and compacted, and gravel was placed in preparation for the concrete pour. Granite pavers were installed by United Stone & Site with McCourt support. Additional improvements included tree grate replacement and meter post installation.